From feasting on turkey with all the trimmings to ringing in the New Year with friends and family, TIME Hotels is granting all your Christmas wishes thanks to a cracking calendar of festive fun. 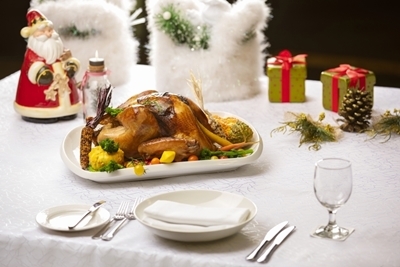 Hosting a special festive feast at home for Thanksgiving or Christmas? Impress your guests with a perfectly cooked Turkey prepared by the TIME culinary team. Simply place your order and pick up a delicious 5-6kg herb roasted Turkey with all the trimmings, complete with the choice of gingerbread cheese cake or pumpkin pie within 48 hours. Order will be honoured until 30 December 2018 at both TIME hotels. Nothing will get you in the Christmas spirit more than TIME Hotels’ Gingerbread House, where you can get hold of all your festive favourites. 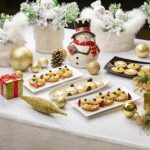 Pass by this season at TIME Grand Plaza Hotel from December 3 and enjoy an array of seasonal pastries, Yule logs and much more. Start the season in twinkling style by attending the festive tree lighting ceremony taking place from 6pm onwards on 5 December at TIME Grand Plaza Hotel and at 4.30pm on 6 December at TIME Oak Hotel & Suites. Spend the night before Christmas with your nearest and dearest, complete with a traditional dinner and a visit from Santa. Among the delicious dishes on offer are smoked salmon rolls, poached pear and gorgonzola salad; roasted butternut squash soup; slow roasted Young Turkey with cornbread stuffing, herb roasted grass-fed Australian strip lion and root vegetable gratin. Those with a sweet tooth will adore the dessert selection, which includes mini pumpkin tartlets, saffron crème brulee and gingerbread cookies. The dinner takes place from 7-11pm at Brio Restaurant, TIME Grand Plaza Hotel, priced at AED170 per person with soft drinks, juices and sparkling beverages; and from 6.30-11pm at Pranzo Eatery, TIME Oak Hotel & Suites, and is priced at AED 160 per person, including soft drinks, juices and sparkling beverages. There is a 25% discount for bookings made up to 10 days before Christmas Eve; and a 20% discount for in-house guests at TIME Grand Plaza Hotel. At TIME Oak Hotel & Suites there will be a 20% discount for bookings made by the 15th December; and a 30% discount for in-house guests. Christmas is a time for giving, of course, and for those who want to make a holiday out of it, TIME Grand Plaza Hotel is offering a complimentary upgrade to an executive room when booking a deluxe room and 20% off on Christmas Eve dinner at Brio restaurant. At TIME Oak Hotel & Suites, book a magical Christmas staycation and enjoy a complimentary Christmas Eve dinner or Christmas Day brunch for those who stay overnight on the 24th December. Christmas Day Brunch is sure to be a jolly old affair for all. Taking place from 12.30-4pm at Waves Lounge, TIME Oak Hotel & Suites, there will be complimentary swimming pool access for those who feel the need to cool off afterwards. It costs just AED135 per person with soft drinks, juices and sparkling beverages. There is a 20% discount for bookings made before 15th December; and 30% discount for all in-house guests. The joyous celebrations continue right through to New Year. Get set to mark the start of 2019 with a spectacular New Year’s Eve party complete with live entertainment. Head to Brio Restaurant at TIME Grand Plaza Hotel, which is hosting a New Year’s Eve buffet from 7pm to midnight, costing AED 285 per person with soft drinks, juices and sparkling beverages. Alternatively, you can party the night away at Pranzo eatery and Mashrabiya at TIME Oak Hotel & Suites, both of which are hosting a special dinner from 7pm to 2am for only AED 225 per person with soft drinks, juices and sparkling beverages. Then when you’ve danced until you’re ready to drop, give yourself a treat and stay overnight. Book a deluxe room at TIME Grand Plaza Hotel and receive a complimentary upgrade to an executive room, complete with 20% discount on New Year’s Eve dinner and brunch. There is a 25% discount for TIME Grand Plaza Hotel New Year’s Eve dinner bookings made up to 10 days before 31st December and 20% discount for all in-house guests. Start the New Year in style with brunch at Brio Restaurant, TIME Grand Plaza Hotel. Brunch runs from noon to 4pm and costs AED 165 per person, which includes soft drinks, juices and sparkling beverages. Or celebrate the first day of New Year at Waves Pool Bar, TIME Oak Hotel and Suites, from 12.30-4pm, and enjoy a spectacular BBQ for just AED 135 per person, which includes soft drinks, juices and sparkling beverages. You can also enjoy some fun in the sun with complimentary pool access. At TIME Grand Plaza Hotel, there is a 25% discount for bookings made 10 days before New Year; and a 20% discount for in-house guests. While at TIME Oak Hotel & Suites, there is a 20% discount for all bookings made by the 20th of December; and 30% discount for all in-house guests. To find out more or to book a stay, call 800 HOTELS (468357) or visit www.timehotels.ae.